The Gowanus Lounge: Will Mr. Sitt "Drop Housing" in Coney Island? Will Mr. Sitt "Drop Housing" in Coney Island? We were reading the new Time Magazine story about Coney Island, wondering if it contained anything new. "Uncertainty shrouds the original America's Playground..." Blah, blah, blah. "..no one is quite sure what will become of it in the fall." Blah, blah, blah. 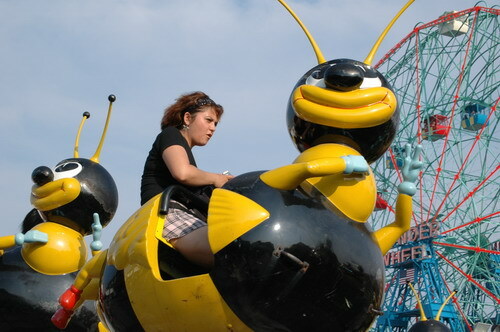 "Coney Island has fallen long and hard from its apex..." Blah, blah, blah. "But Sitt, who lived within walking distance of Coney Island as a child, insists he'll make the place vibrant again and is even considering ways to build his complex without housing." HUH? No housing? Say what? But Sitt, who lived within walking distance of Coney Island as a child, insists he'll make the place vibrant again and is even considering ways to build his complex without housing. "This is one of the most important pieces of American history," he says. And his critics seem willing to drop their opposition if he drops housing. "Joe Sitt can still be a hero," says local historian Charles Denson. "He could go down in history as someone who saved Coney Island." Thor is considering a Coney Island plan without housing? Maybe Mr. Sitt wants to share with us? Do You Have Your Celebrate Brooklyn Widget?